The frying pan is one of the most basic tools that any cook simply must have in their armory. It has a level of versatility beyond any other kitchen tool, and it can be used to turn out a range of recipes as diverse as omelets, steaks, risottos and pan-fried chicken and fish. That is of course just naming a few of the wide range of dishes that can be produced with a frying pan. With its versatility, this really is an everyday tool, and as such, you owe it to yourself to pick up the best frying pan you possibly can. That is where we come in. With this review and buying guide dedicated to the humble frying pan, we’ll look at five of the most popular models on the market today and provide the information you need to find the right one for you. 1. What is a frying pan? 2. Can frying pans go into the dishwasher? 3. What is the difference between a skillet and a frying pan? 4. What is a good frying pan? 5. 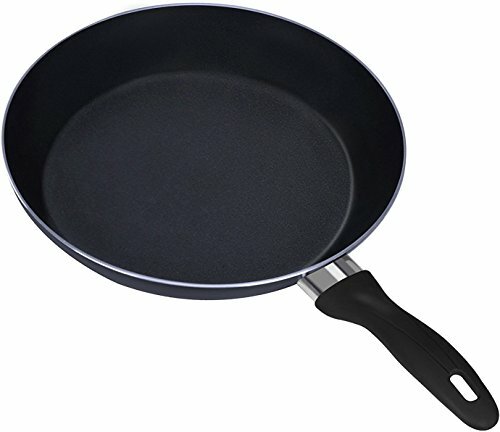 How to measure a frying pan? We’ll kick off the list with this product from Utopia Kitchen. In many ways, this is a very basic model of frying pan, probably the most straightforward design of any of the products we’ll look at today. On the other hand, no one said that frying pans should be loaded with a thousand features and clever design points to be effective tools in the kitchen. This is an 11-inch frying pan of a very simple design. The base is made of an aluminum alloy that is both induction-compatible and designed for excellent heat distribution across the entire cooking surface. Speaking of the cooking surface, it is of a double layer, nonstick construction, and designed to be scratch resistant and highly durable. The big stand out has to be the price, as this product offers phenomenal value for money. Out of the box, it also has a number of beneficial features that you may expect on a premium level product, so it’s great to see them deployed here. For example, many nonstick pans are not suitable for cleaning in the dishwasher, but this pan has a two-layer nonstick construction that is tough enough to stand up to dishwasher cleaning. The nonstick cooking surface is also effective. That makes this pan especially useful for cooking eggs and sautéed vegetables (which can often stick to other pans). The base is made of an aluminum alloy that really helps to spread the heat across the entire cooking surface, which is great for even and fast cooking. Because of the low price point, it is almost inevitable that some part of the construction will be a little lacking, and in this instance, it is the handle. In some ways, that’s not too bad since if some money is going to be saved somewhere, it’s better that it’s on the handle rather than on the nonstick surface for example. The handle is held in place with a simple screw, which is not well designed. You will in fact frequently have to tighten it up, which can be a little irritating. A loose handle can also be a safety hazard. Other than that, despite its toughness, don’t expect this pan to last forever, as it is not quite a premium level product after all. For the money though, it’ll do a great job for how long it is designed to last. Our next product is somewhat unique on our list today for having a stainless-steel construction. This material has a number of pros and cons, which we’ll look at. 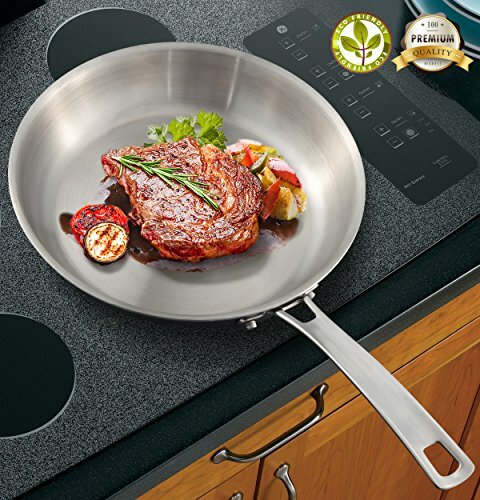 This is a 10-inch pan with stainless-steel outer and cooking surface, as well as an aluminum core. It is oven and dishwasher safe, and it includes a sturdy and ergonomic handle that is connected by two bolts. This pan as an outstanding design. First off, the three-ply design means that you get the benefits of stainless steel, without the big drawback of this material, namely weight. Stainless-steel pans are notorious for being very heavy, but the aluminum inner layer provides strength for a fraction of the weight. That means you get a steel pan here with a weight of 2.5 pounds, which is very impressive. The big benefit of stainless steel is that it is considered a natural surface. That means that no chemicals are used in its construction or coating. If you want chemical-free cooking, that could be a significant feature. The pan is also nice and thick, with a very solid feel. It is also ovenproof (up to 500 degrees Fahrenheit) and dishwasher safe, both very useful features in a pan. 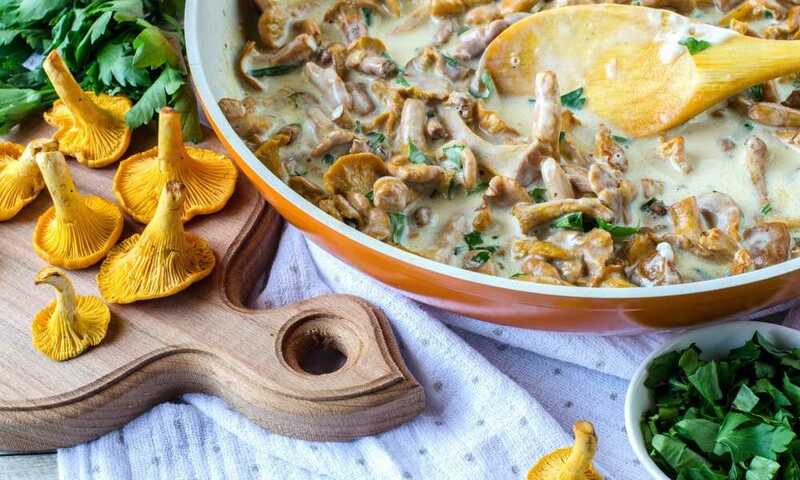 Stainless steel is often the choice of a pan for professional chefs, partly for all the advantages it brings and because it does need a professional hand or at least an experienced one to be used correctly. It has very limited nonstick properties on its own, so the pan must be “seasoned” with layers of oil to build up a useful cooking surface. On the other hand, a nonstick pan is always ready to be pulled out of a cupboard and cooked on in minutes. It will take a bit more effort to use this pan but, frankly, it will be worth it! Our next product comes from Ozeri, and as should be evident in the product image, it is of a slightly different style of construction compared to the rest of the pans on this list. In addition to that stone derived cooking surface, it also boasts a very tough build. As the most expensive individual pan on the list, does it deliver enough to justify that price tag? This is a 12-inch frying pan from Ozeri, and the main highlight is the stone derived lining, which the makers claim to provide a tough and durable nonstick cooking surface without the number of chemicals that are used to manufacture traditional non-stick surfaces. 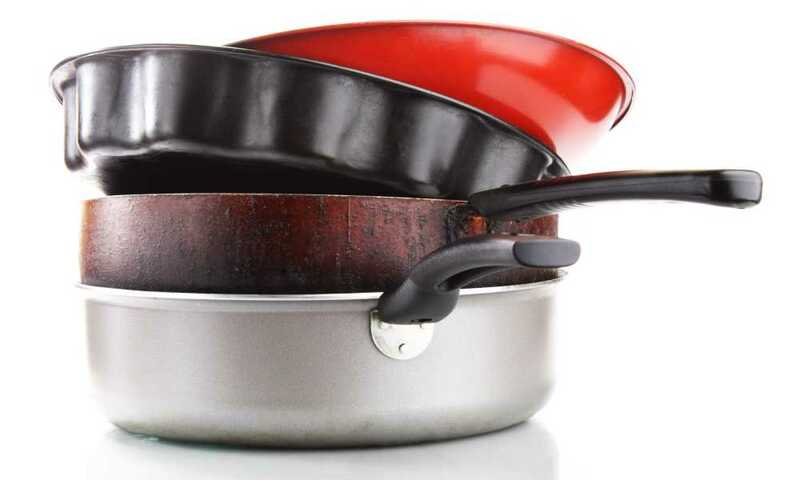 The outer part of the pan is made of a very durable, heavy-gauge die-cast aluminum while the handle is comfortable and coated with heat-resistant silicone, and it is also secured to the pan body with sturdy rivets. We really liked the stone-derived coating. 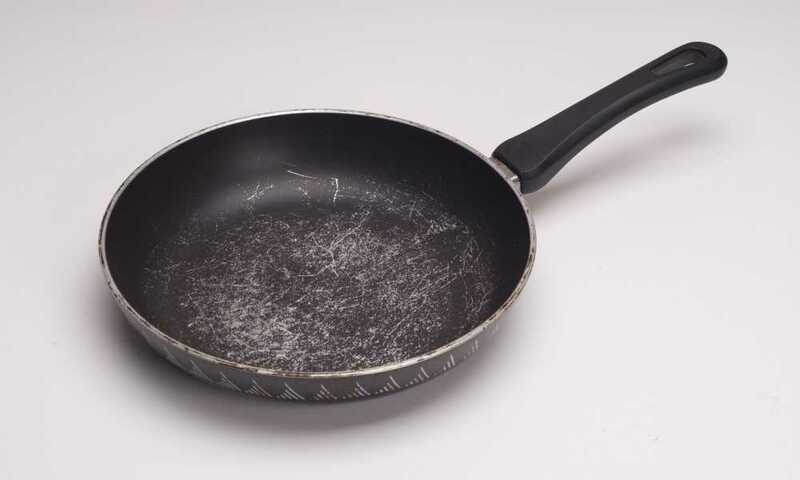 If you are at all concerned about the possible harmful effects of the various chemicals that are used in some other nonstick linings, then this pan could interest you. The stone-derived surface is made by a company in Germany, and it is both extremely durable and provides an excellent non-stick coating. Aside from that, the pan is clearly well constructed and feels very solid in the hand. The pan base is made of a die-cast, very heavy gauge aluminum that feels solid and long-lasting. The handle is comfortable to hold, especially with that silicone lining. It is attached securely with no less than three rivets, making a secure connection between handle and pan that you can trust. There are two issues with this pan. The first is the price, but given its strong construction and premium materials, it’s actually not as expensive as you may assume. It is though still the most expensive on our list, at least for a single pan, so that does need to be highlighted. The other issue is with the pan coating. Did you see how we used the word “derived” when talking about this product? There are pans out there that actually use stone as the cooking surface. 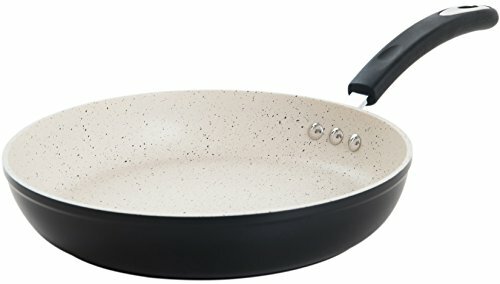 This pan still uses fewer chemicals than many others, but the fact it is stone derived does mean that it is a cheaper surface than you would see on true, top-end stone pans and that does mean it contains trace amounts of PTFE, the chemical most associated with nonstick surfaces like Teflon. Something to bear in mind if being completely chemical free is very important when you are looking for a frying pan. Our next product is actually not one, not two, but three pans. It also comes with a handy set of tools, so you’ll be all ready to get busy in the kitchen! Is there more to this product than just it’s multipack value? 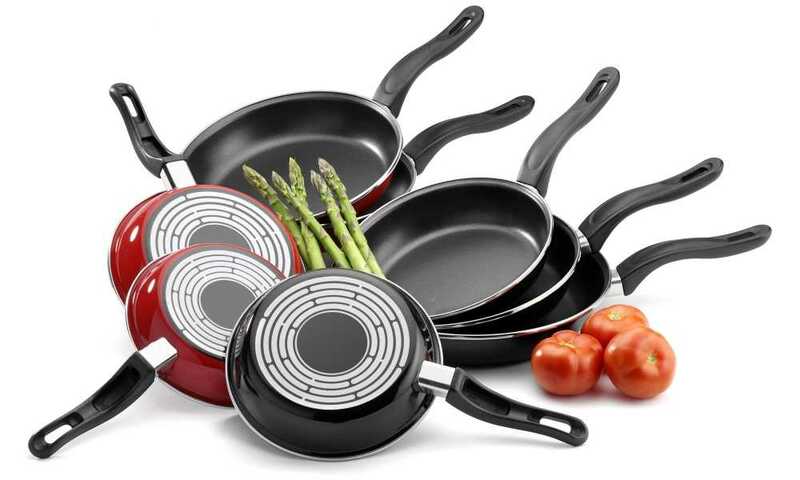 This is a three-pan set, comprising one each of eight, 9.5, and 11-inch pans. The interior is made of Fusion Tech nonstick lining that is free from PFOA, PFTE, lead, and cadmium. The exterior is stainless steel and fine to use on induction heaters, while the handles are ergonomic and of metal construction with a double rivet attaching them to the pan body. You also get a free spatula set. 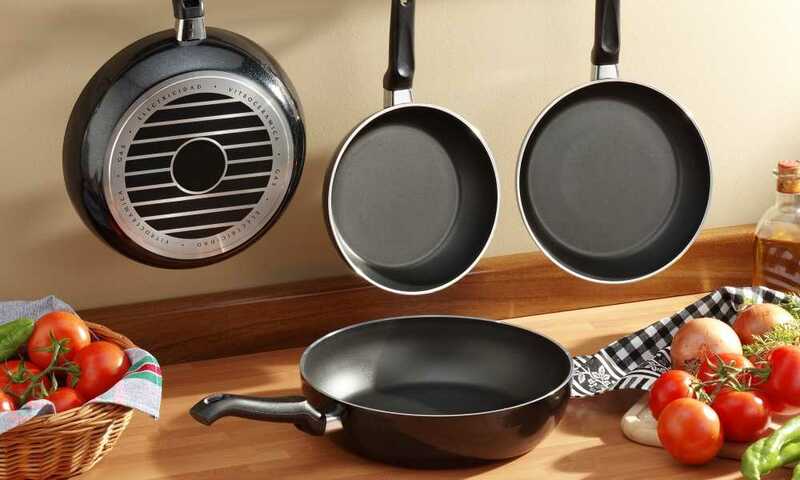 The fact that the nonstick lining is guaranteed free of a range of chemicals and compounds such as PFTE and lead is a great sign, and one of the standout features of this pans. The strong aluminum base is also amazing since it not only gives the pans a nice, heavy feel, but it also means they transfer heat evenly across the base. This, in turn, prevents hot spots forming, helping you cook your food evenly and without burning. The metal handle, as you would expect on chef-level pans, means that it can be placed under the broiler or in the oven with no worries about melting the handle. It is also ergonomic and comfortable to hold, while the twin rivet attachment is strong and tough. 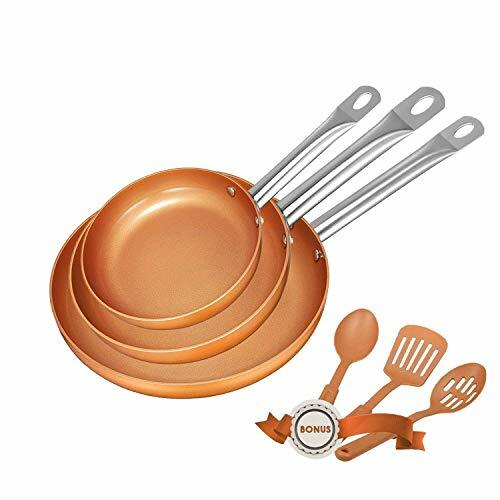 Throw in the free spatulas, and this is a very well designed, solidly built set of pans for a phenomenally low price. There are a few issues with this set, but they are not exactly deal breakers. For one thing, those metal handles are durable and do allow the pans to be used in different environments. They will also get very hot if they are used under the broiler or in the oven. You must be careful and always use a towel or gloves when taking the pan out from under the broiler or from the oven. The other minor issue is the fact that the three pans are quite similarly sized, especially the eight and 9.5-inch models. It would have been nice to see maybe a six or seven-inch sauté pan and a 12-inch multipurpose size instead. As we said though, these are very minor complaints against what is a very good product. Our final item is another entry from Utopia Kitchen that produced product number one on the list. Since we’ve already reviewed this manufacturer, we have an idea of what they bring to the table in terms of general design and construction. However, this product is clearly a little different from the rest. The exterior of the pan is constructed using a super-conductive aluminum alloy material, while the cooking surface is constructed out of a durable, two-layer nonstick coating. The entire construction is dishwasher safe. In addition, this particular pan also comes with a glass lid, an extra Bakelite handle as well as taller sides to give it 4.6-quart total capacity. 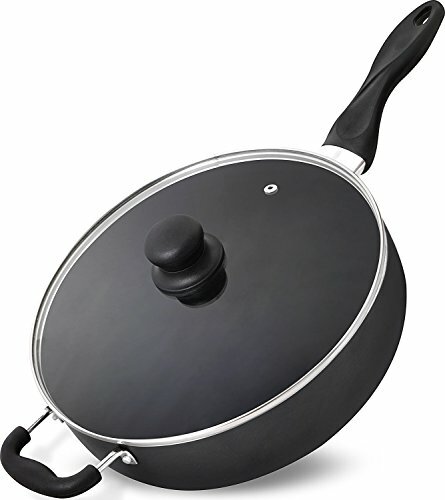 The extra tall sides and the lid make this pan unique and very useful and make its design essentially a halfway point between a traditional frying pan and a conventional saucepan. That could be very useful especially in smaller kitchens where storage space is at a premium. The nonstick coating means you can fry items as in any pan, while the lid allows you to cook sauces and sweat vegetables. We love to see that the whole pan is dishwasher safe, and it boasts the aluminum alloy construction we saw in the previous Utopia Kitchen pan. That helps to evenly spread the heat across the cooking surface, while also being nice and tough. 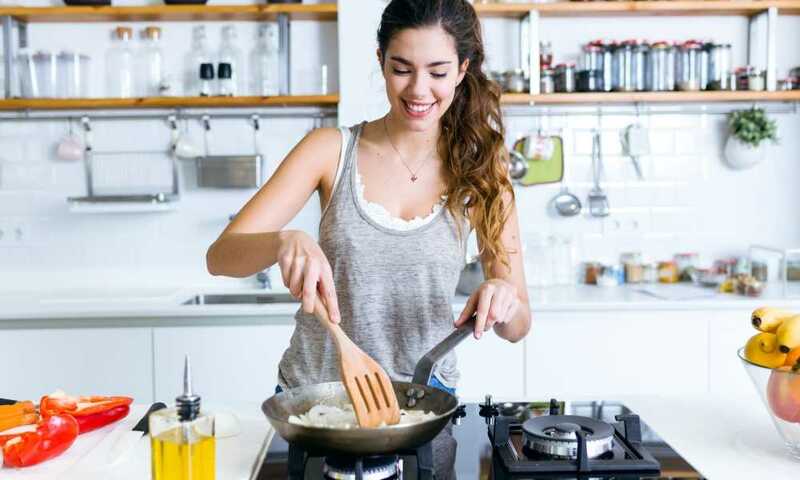 The higher sides can make it harder to cook some items, especially things like fried eggs that require careful use of spatulas. The high sides simple provide fewer angles to work with the food that is being cooked, making it harder to reach some food items and lift them out of the pan. It’s also quite a heavy pan, weighing in at a shade under five pounds. A lot of that weight is the glass lid though, so you can minimize it by moving the two pieces of the pan separately. What features should you bear in mind while making your selection? For such a seemingly simple kitchen tool, there is actually quite a bit of knowledge you should maintain while making your selection. In this next section of the guide, we’ll go through the features you should look at, and answer some of the most frequently asked questions about this handy piece of cookware. We are talking about the construction material here. 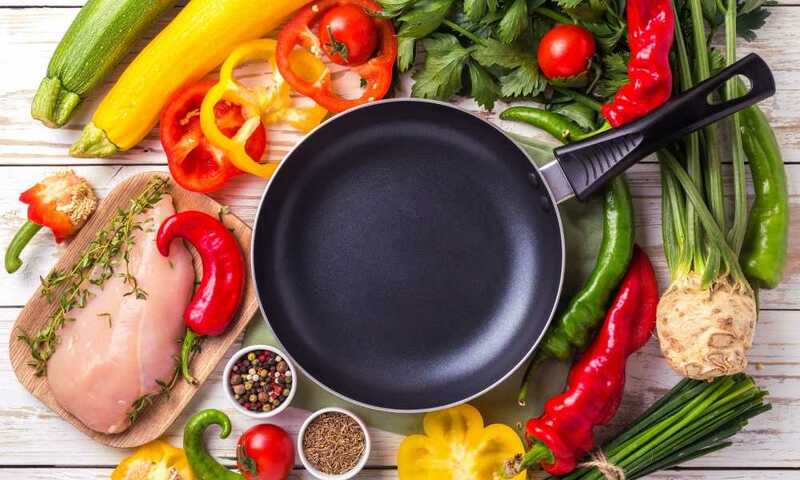 There is actually quite a wide range of materials that frying pans are made from, with stainless steel, copper, aluminum, and cast iron being among the most popular. In this list, we’ve concentrated on aluminum since even most stainless-steel models have an aluminum core! An aluminum material, especially when it is an alloy, provides an excellent mixture of strength and even heat distribution. At the same time, it is lighter than cast iron and has a lower cost than copper. Some of the features to look out for include a nonstick coating and dishwasher safety. 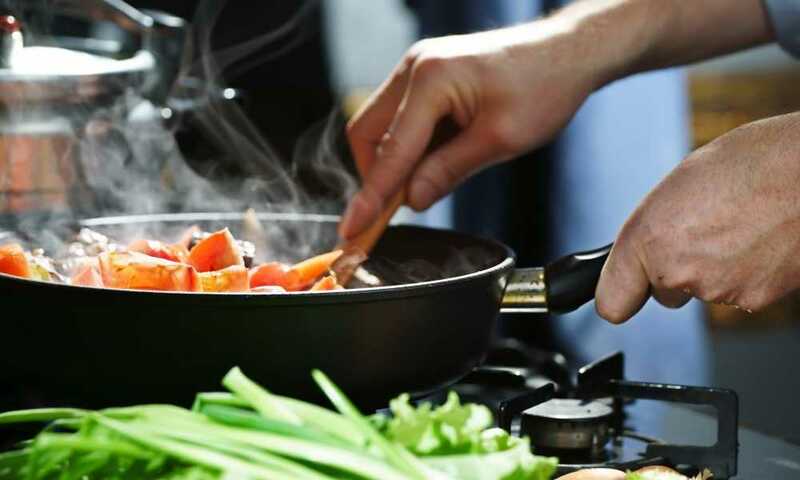 Nonstick means that you can use far less oil when frying, helping to make your meals that bit healthier. Dishwasher safe means that clean up after cooking is a bit easier! The handle is also a feature to consider, as this will be the point that you are physically coming into contact with the pan. It should, therefore, be comfortable but also strong and sturdy. Size will be measured in inches and will generally range from as small as six inches up to 12 inches. The smaller pans are better for cooking eggs and smaller pieces of protein like single steaks or chicken breasts. 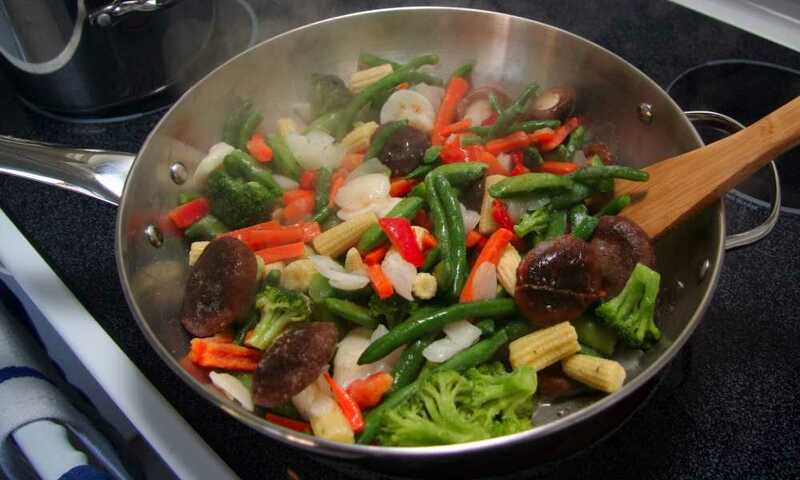 The larger ones are better for sautéing large amounts of vegetables, browning big pieces of meat before they go into the oven, or cooking multiple items at the same time. So, it is best to have the biggest range of frying pans that your budget and storage space will allow for. Most frying pans are of a singular design, irrespective of construction material. There is another type of pan that, by having taller sides and a lid, are more like skillets. These are also useful to have in the kitchen as they serve a different purpose than a traditional frying pan. Again, if you have space and budget, it will be worthwhile to pick up a variety of types of frying pan as well as a variety of sizes. The brand can be a useful indicator of how a pan will cook. So, as we suggested above, it can be very useful to have a range of frying pan sizes and types in your kitchen. By buying the same brand across those sizes and types, when possible, of course, you can be sure of the certain level of uniformity in terms of cook times. This is because the same brand will typically use the same materials and base thickness in every size and type. A frying pan is a piece of cookware that is designed for frying food. This could be fishes, chickens, steaks, vegetables, or eggs. As such, these pans generally have far lower sides than a saucepan to allow better access to the food, making it easier to turn and lift food with a spatula or a similar tool. Unfortunately, there is not a universal answer to this, especially when it comes to nonstick pans. That is because it really can depend on what the nonstick coating is made of, and how it has been applied to the pan. Fortunately, being dishwasher safe is a big selling point, so generally speaking, most pans are labeled if they are dishwasher safe, making it easy for you what to consider. A frying pan is a flat-bottomed pan that is generally used for frying things like meat, fishes, and eggs. A skillet has taller sides and is often made of cast iron and has a lid. It can be used to fry but also has wider applications such as cooking stews, risottos, and other food with more liquid. As you might have seen in the list above, there can be quite a variation in design and product features. It really depends what you need it for, but a good-quality pan like the ones we looked at above will usually be suitable for a wide range of uses. You might have noticed above that we referred to pans in inch sizes, ranging from eight to 12 inches. This measurement is taken by measuring from edge to edge across the top of the pan, from the two widest points. It was a tough choice to pick the best product out of this line up of high-quality cookware. After some deliberation (and a lot of omelets), we decided product number four, the DEIK Frying Pan Set takes the trophy as the best frying pan or should that be frying pans to make our list. We were especially impressed with both the versatility of the three pans, plus the high-quality nature of their design and construction. It seems to us that, with a kitchen tool as important as a frying pan, why buy one top-quality pan when you can buy three?